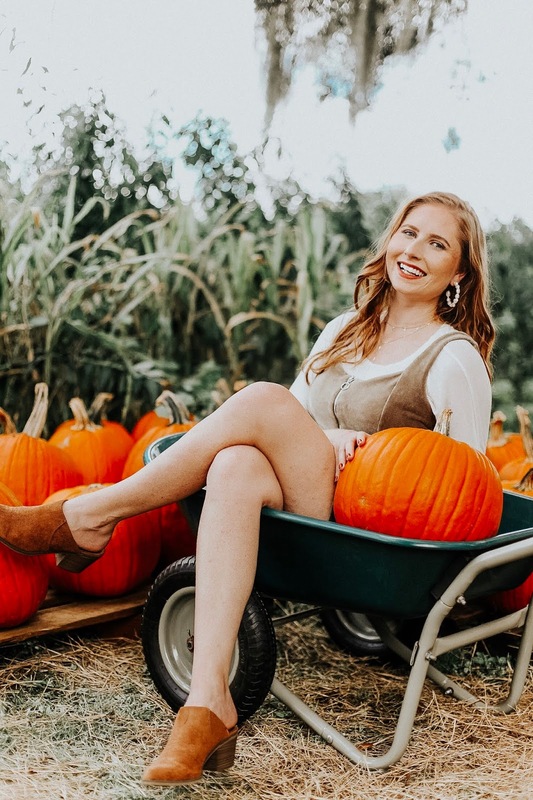 Instagrammable pumpkin patches are far and few in St. Pete, which is why my blogger friends and I decided to venture up north to Brooksville to find the cutest patch in Florida for photos! My Insta bloggers friends Ayana, Lora, and Elissa and I all met up in Ayana's neck of the woods, Wesley Chapel, before driving 30 minutes up to Brooksville together in one car. Of course, we naturally stopped at Starbucks prior to walking into the pumpkin patch! I ordered a grande chai tea latte (hello, caffeine!) with a pump of pumpkin syrup for the occasion. Once we were settled back into the car, Lora and Elissa whipped out their vlog cameras to document the trip, which is so cool! I really want to try vlogging but I have no idea how to start! I will need to just bite the bullet and record myself talking about make up one of these days. Anyway -- back to the adventure! I'm breaking down exactly how much the trip will cost you and what you should do once you arrive at Sweetfields Farm. To enter Sweetfields Farm, you will need to pay a fee before taking part in the festivities. Luckily, with technology continuing to improve, you can easily swipe your credit card with their iPad system to pay the $10.00. Don't worry if you forget to bring cash! At first, my friends and I were concerned that we wouldn't be able to enter without cash and we were definitely relieved to find out that we could use our cards. What a shame it would have been to turn around after such an adventure out to the middle of nowhere, yikes! All four of us chose to go through the fall maze, mini edition. Little did we know that this mini-maze would turn into such a complicated path! It was fun for us to explore the field, but we were stressing out about finding our way to the actual exit. Ayana and I kept laughing at the fact that we both are city slickers and are not cut out for nature! Yes, we tried to pretend it was fall in Florida, yet all of us were dressed in our cutest fall-appropriate outfits in 90-degree weather. Not a good combo! Elissa helped us find our way out of the maze, thankfully. There is also a larger maze to walk through if you have more time and patience. Friends, if you want to relive the best part of your childhood, go to Sweetfields Farm for the SWINGS! There are two wood plank swings hanging down from a huge oak tree that we all posed with and took some cute photos on. Swinging from it made me feel like a little kid again! We had to gently fight the children for a spot in line to swing from the tree, but eventually, we all took turns! Lora looked so adorable swinging from the tree in her flowy dress! There is another major reason why you should venture out to Brooksville to visit the Sweetfields Farm and that is for the pumpkins! 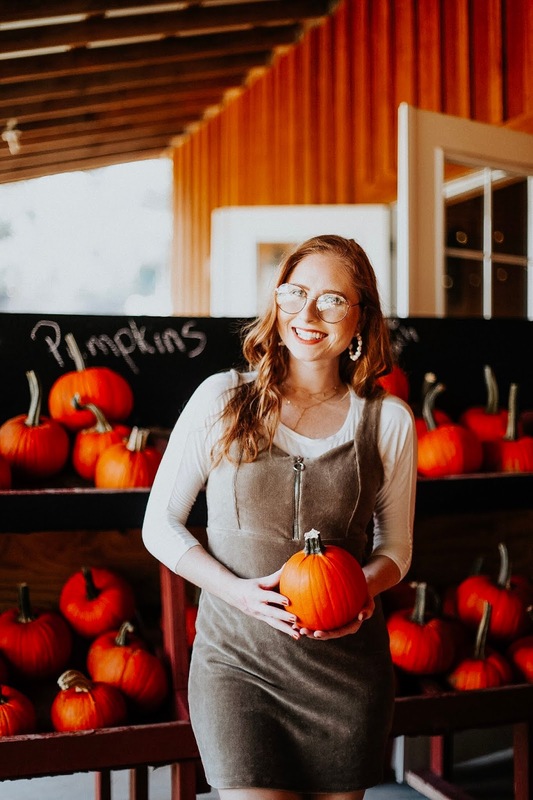 Spend the last portion of your time at Sweetfields to gather around the pumpkins for the best photos with little crowding. The entire field is packed with bright orange pumpkins in all shapes and sizes. You can pose with them, like we all did, or decide to buy them up one by one. I already have two pumpkins back at home so I wanted to pose with these pumpkins for cute Instagram pics! There are quite a few food trucks at Sweetfields Farm for you to enjoy a meal. Everything from caramel apples to kettle corn can be eaten here as fall treats! Earlier in the morning, I had some hashbrowns for breakfast so I was only craving a refreshing drink from all the walking around we did in the maze. My options were fresh apple cider or homemade lemonade. I saw two girls walking around the swings carrying huge mason jars filled to the top with lemonade and I was sold on buying my own! I asked them where to buy the lemonade and we were directed to the food corner. The lemonade did NOT disappoint. It was freshly squeezed and loaded with tasty sugar to combat the acidic lemons. The huge complimentary mason jar was a nice added touch as a souvenir to take home with you and I can't believe it was all less than $10! I highly recommend buying some lemonade once you arrive at the farm because it's insanely delicious in my opinion. This is the most Instagrammable spot in town for cute photos by the pumpkins. It's worth the drive and I'm grateful for the time I had last Saturday exploring this new area with Ayana, Lora, and Elissa. Sip on their homemade lemonade as you sit back and relax on one of their hay rides or while you zig-zag your way through the mazes. I'm totally going to share this will all of my Tampa/St. Pete friends! Lucky girl! I cannot wait to go to a pumpkin patch this year!